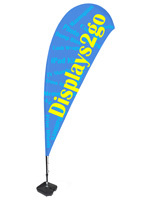 These Advertising Flags and Banners are Fully Colored Signs for Promotional Presentations! Flagpoles, Like Outdoor Feather Signage Solutions, Focus Marketing Directly on Specific Audiences! Visit Our Online Store for Quality Advertising Flags and Banners! 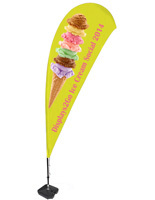 These advertising flags and banners are complete outdoor promotional kits that come with TriPole stands. The included graphic is a full-color, single-sided print. These flagpoles are sizeable at 13' 1" tall, enabling them to be used successfully at street fairs, carnivals, concerts and more. 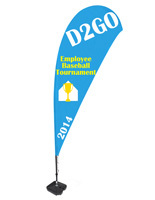 These advertising flags and banners, like feather signage, will work with the supplied 31-1/2"w x 94-1/2"h displays. These enormous outdoor stands are crucial for any business, as they provide an innovative solution for promoting goods, exhibiting sponsorship or showcasing new brands. Advertising flags and banners are engineered for the outdoors and can endure reasonable weather conditions, yet they also serve as fantastic interior marketing tools. An interesting characteristic of these promotional fixtures is that they necessitate only one person for assembly. 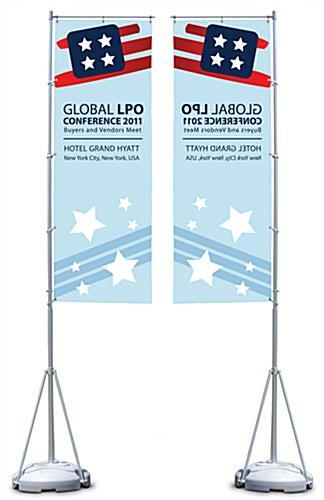 These advertising flags and banners have telescoping flagpoles manufactured from sturdy aluminum that collapse for efficient stowage. Graphics are clasped to the flagpoles while at the ground level. Then each section of the pole is extended upward and secured. 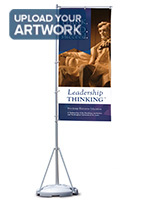 The horizontal arm feature stretches signage, which results in highly visible promotional displays. This flag armature also turns in the wind creating attention-grabbing motion while maintaining stability. At the base of the flag pole is a three leg support and plastic base. Each molded base is fillable, which also stabilizes the unit. The base accepts eleven gallons of water or sand for a solid foundation. 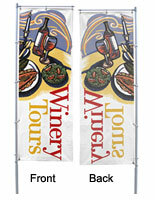 These advertising flags and banners are tri-color displays that are printed from your artwork or designs. The submitted graphics are heat transferred onto a strong knitted polyester fabric with a silk-screening process. While the graphics are printed on one side only, they penetrate through the fabric resulting in a horizontally flipped image on the reverse side. Because these custom signs are printed with a silk-screen technique, a minimum quantity of ten is necessary. When repositioning these displays, take advantage of the enclosed carrying bag! 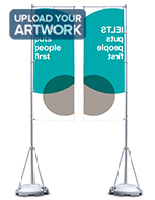 We are proud to offer signs for these TriPole advertising flags and banners. We have researched many different options and have come up with a solution that we feel is the best quality and most economically priced. These are real flags that will blow in the wind, not heavy vinyl banners. Although they are not the most inexpensive pennants you may find, with proper care and use they will last for years without fraying while preserving bright coloration.